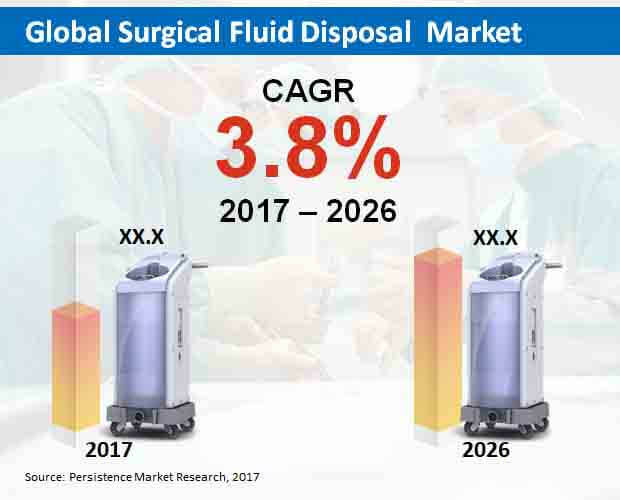 A weighted market segmentation of the entire surgical fluid disposal market unmasks different viewpoints that portray a realistic view of the global market. There are several types of fluids that essentially need disposal systems. Disposal of surgical fluids generally takes place during the procedure or immediately after the surgical procedures. Fluids such as spinal fluids, blood, dialysis waste, saliva, lab specimen and cultures, amniotic fluids and other medications like chemotherapy drugs are typical examples of fluids that need to be disposed. Disposal of surgical fluids is a continuous procedure and is imperative to carry out the disposal procedure immediately as it becomes difficult to clean up the spelt fluid. The spilling can take place easily and unknowingly which can cause infections to the patients as well as staff. Several companies are involved in manufacturing of devices that ensure effective surgical fluid disposal off the healthcare facility. Persistence Market Research has drafted a research report on global surgical fluid disposal market after intense research carried out on the subject. Various elements involved in influencing the market’s growth across the globe have been analyzed and studied so as to give a clear understanding of the subject market. The research study also includes impact analysis of these aspects, thus portraying the intensity or magnitude of their influence on the overall market’s growth. The research depicts future market projections along with current market scenario as well as historical data analysis. According to the insightful research report on the global market for surgical fluid disposal, the global market is estimated to reach a value of over US$ 4 Bn by the end of the year of assessment from a value a bit under US$ 3 Bn in 2017 and is projected to reflect a listless CAGR during the period of assessment, 2017-2026. The research report is segmented in detail to portray a holistic market scenario covering vital information across various segments across various regions in the globe. In the region category, Asia Pacific excluding Japan (APEJ) is expected to showcase higher consumption of devices used for disposal of surgical fluids. The surgical fluid disposal market in APEJ is projected to grow at the highest value CAGR of 4.2% throughout the period of assessment. However, with respect to market share and strength, North America is estimated to reach a higher market valuation with US being the main contributor. North America is expected to lead the global market, whereas APEJ is anticipated to reflect potential growth opportunities. Europe on the other hand, is expected to be the second largest with respect to market value. With respect to product type category, tubing sets are expected to witness higher adoption for carrying out the disposal of surgical fluids across hospitals and other healthcare facilities. The tubing sets segment is projected to grow at a relatively high rate throughout the period of assessment and is expected to touch a significant valuation by the end of the period of assessment. However, the containers segment is the largest with a high market share as of 2017 and is expected to continue with this trend during the forecast period. This segment also radiates high growth opportunities for key players in the coming years. The global market for surgical fluid disposal market includes analysis on major players involved in the manufacturing and distribution of devices for disposal of surgical fluids. Key players such as B Braun Melsungen AG, Medtronic, Inc., Smith & Nephew, Cardinal Health, Inc., Baxter International Inc., Allen Medical Systems, Allied Healthcare, Ecolab Inc., C. R. Bard Inc., and KARL STORZ GmbH & Co. KG have been profiled in this extensive research report.